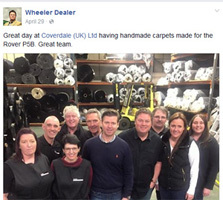 Wheeler Dealers choose Coverdale for their latest project. 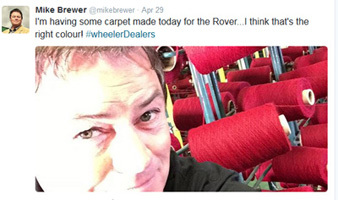 When Wheeler Dealers' Mike Brewer and Edd China needed a carpet set for their Rover P5b they had no hesitation in coming to Coverdale, and we were only too happy to oblige! 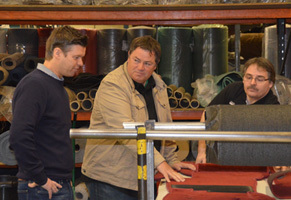 The starting point is the manufacture of the carpet itself, which is done on specialised machinery by feeding yarn through a row of needles into a backing cloth. 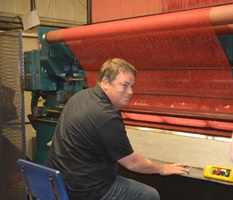 The loops are then cut off to produce a nice, smooth cut pile carpet. Next we needed to cut out the carpet. Mike had selected Antique Red as the colour, so once the correct roll of carpet was put onto the cutting the table the Rover P5b pattern was selected from our huge library. 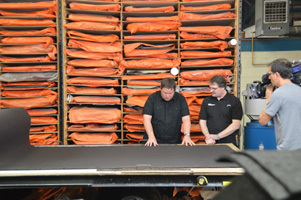 Every piece of carpet was then marked in and cut to the exact shape and specification . Our skilled sewing machinists then put the edging onto the carpet, stitched the set together and added a driver's heelmat. 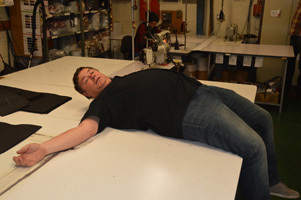 Mike even donned a Coverdale tabbard and attempted to do some sewing himself, and just about escaped with his fingers intact! The episode launched the second half of series 12 and was first shown in the UK on 17th August 2015.